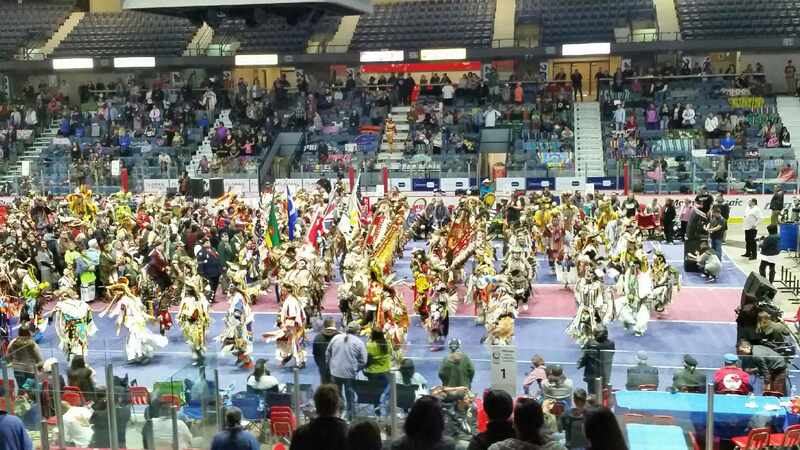 The FNU Pow Wow 2017 was last weekend at the Brandt Center in Regina. The First Nations University Pow Wow is one of the largest in Canada, with hundreds of competitors and thousands of spectators. Northern Strands sponsored the events first responders, Northern Strands T.E.A.M Response. T.E.A.M Response is composed of first responder volunteers, including two of our own Safety Trainers, Cassenna Parameter and Belinda Mitchell. The Nine members of T.E.A.M Response volunteered 160 hours over the 2 days, providing basic medical services for the First Nations event. The volunteers honored the First Nations people, Northern Strands and all involved by displaying professionalism, empathy and compassion to everyone in need of assistance. In appreciation, an honorable mention was made on behalf of Northern Strands T.E.A.M. Response as part of the Master of Ceremonies opening speech. Regina’s Police Chief Evan Bray stood as honor guard for the event. Coincidentally, his daughter volunteers with T.E.A.M. Response. Father and daughter posed for the picture you see below.